The people here on TenMania are passionate foodies loving to explore different cuisines, out of ordinary tastes, to try all sorts of menus and experiment with classic, traditional, avant-garde recipes and for that they need to look like a professional chef. As you may have noticed, we are always in the search for the next most delicious dish to try, and we admit we had a lot of fun lately during Thanksgiving. In some trendy restaurants these days, the chefs’ fashions may be hotter than the stoves. Perfectly true, especially if you took a good look at some of these culinary masters and noticed there are more things to aprons and hats than the eye can see. The chefs’ uniforms are more than a trademark of their profession, they quite a history and fulfill a lot of roles, from providing the chef’s security and comfort while cooking, to ensuring a clean environment and give us a feeling of safety and trust in their profession. We talked about stylish professional uniforms a while ago, but out hearts were swept away by the chefs’ ones. And since modern culinary artists use a lot of interesting apparel, we thought about it and decided we too want to put together a chef’s uniform and get some hot, new, trendy pieces of equipment. So, let’s see 10 outfit items that will make you look like a professional chef! The chef’s hat has one of the most interesting stories as part of a more complex professional uniform, which can be traced back to ancient Assyria. You may think that the hat has only a functional role to play, as in keeping the chef’s hair falling into your Chateaubriand steak (yuck! ), but in ancient times, having a hat to wear was a symbolic trademark for a particular chef that was highly appraised by a king or a high authority. Let’s put it like this: it is a symbol of a crown which was offered by a king for instance, for expressing his appreciation towards the chef for you know… not poisoning him or not allowing the enemies to poison the king’s food. Moving forward in history, welcome to Europe and the French “toque blanche“, the white tall hat that became a symbol for all cooks in the world. It has a double function, of safety and of rank. Around the 1800, French culinary artist Marie-Antoine Carême insisted on bringing unity to the chefs’ outfits and introduced the sized hats in order to display kitchen rank. Modern chefs, however, fine-tuned the old white hats and now they are opting for more trendy and stylish ones that come in black and use comfortable and fashionable materials. 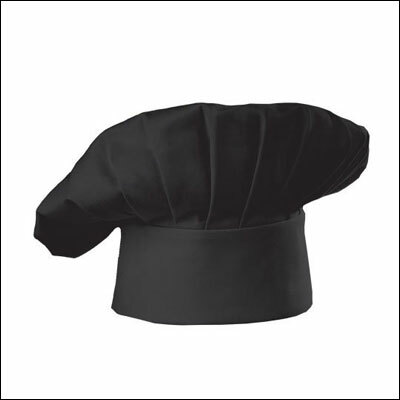 Here is one such model if you’re interested in getting a classic-turned-modern chef’s hat! Maybe you won’t see Jamie Oliver wearing a toque or a beanie any time soon when he’s working his magic on TV, but we bet he wears something when he’s back there in the kitchen, getting ready to tantalize us with his Christmas dinner recipes. 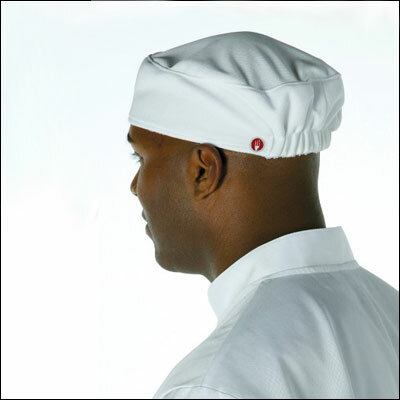 However, not all chefs love to wear the big hat, so modern and trendy ones switched from Ratatouille’s tall hat to a lighter, easy to wear, fashionable and highly safe and functional toque or beanie. The new ones come with adjustable closure buckle in back or are made out of exclusive cool vent fabric, internal sweatbands and elastic back, so that one size to fit all chefs. You may think that the beanie looks like a surgeon’s cap, and basically, why not? Even surgeons have a sense of fashion when they enter the OR and chefs probably learned that the more comfortable and safe the head gear is, the easier and more successful the final result will become. HERE is a toque model that strikes our fancy, while HERE is the skull cap beanie some of us fond to be the most useful and chic. Now this is a mandatory outfit item that will make you look like a professional chef, provided it is always stylish and clean. Don’t get us wrong, we know that the main function of the apron is to keep us safe from mess, splashes, stains on our clothes and since ancient times the apron is associated with cooking. But from a professional chef’s point of view, the cleaner the apron, the higher the skills. You will see famous figures wearing aprons like we’d wear some fancy fashion accessory, but you won’t see any drop of soup splattered on their chest. 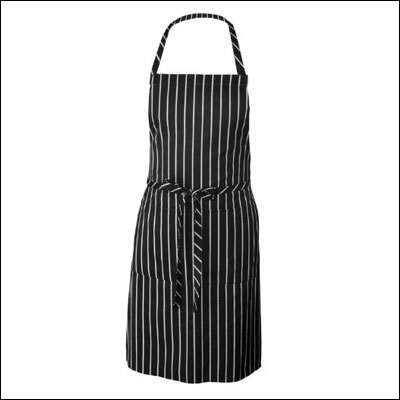 Back in the day, aprons were white, just like most chef apparel, but as we said, nowadays, we can see them wearing black aprons, and boy do they look hot, striped aprons in black and white or color combinations that will lure anybody into getting one. 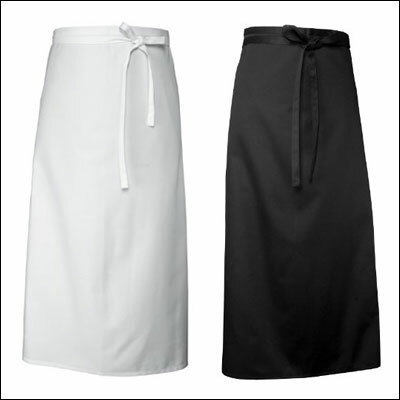 But keeping it professional, these modern aprons are not made only to satisfy the chefs soft spot for fashion. They are resistant, easy to clean, come with pockets, are practical and fit both the ladies and the gentlemen. HERE is what some of us want for Christmas! If you take a good look at modern chefs, you will see them wearing a chef’s jacket or shirt (we will talk about soon) and a long apron, as it is quite uncomfortable to wear a fancy embroidered jacket and a classic apron all over it. So the long apron still follows the safety and cleanness rules, while allowing the artist to move freely and to feel at ease. Long stylish aprons however, don’t make it only to chefs wardrobes, as many restaurant and hotel staff wear them too, as a distinctive mark for their profession and the brand they represent. A matching shirt and long apron became a trademark even in fast food stores that care for their etiquette. And, to be honest, it may be the best outfit item that looks great on men who wear trousers and a long half-skirt over them. HERE is something we both agreed it would fit both future male and female chefs. The chef’s coat is a double-breasted coat made from a thick cotton material. Double-breasted means that the coat is fastened by lapping one edge of the front over the other and having a double row of buttons with a single row of buttonholes. The buttons on the front of the coat are traditionally knotted cloth buttons and the sleeves are long. 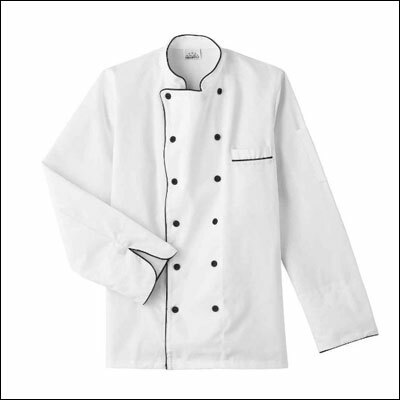 Usually white, traditional chef coats were designed for cleanliness and safety. Now the history of the chefs’ coats and jackets is quite interesting and since we already mentioned Marie-Antoine Carême, he is also the one that can be named the trendsetter in this regard. Back in his days, the chef’s coats were grey, but he convinced everybody that white was a more appropriate color, as it suggested pureness, cleanness and style. Nowadays, chefs’ jackets come also in black and even vivid colors, but there are distinctive designs on them, embroideries that have a powerful meaning (they may display the name of the artists, the company they work for, their rank as a culinary artist and even the style of the cuisine he or she is specialized in). The chef’s jacket is the highlight of a true professional’s outfit and the key outfit item that will make you look like a professional chef. There are also differences between the white and the black chef’s jackets and, believe it or not, people take these matters very seriously. HERE is what we found to be practical, stylish and easy to wear and to take care of. As we said, a cool black utility chef’s shirt matched to a charcoal white striped long apron turns a man into a fashion god in the kitchen, not to mention that a pro knows exactly what to wear in order to avoid getting sweaty, messy or look negligent. The shirt came as an alternative for the jacket, as it is lighter, easy to wear and to clean, is usually short – sleeved and allows the artist to move quick and effortlessly. 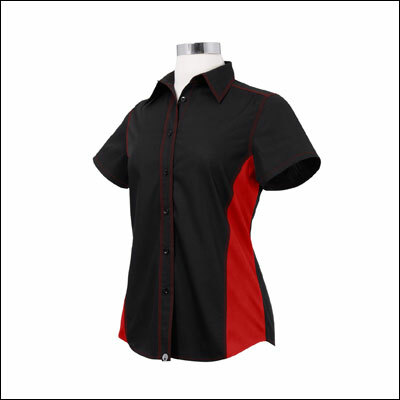 Modern shirts come with cool vent materials matched with cotton and stylish modern designs. The present trends in uniforms’ design have a more jolly note to them, as modern outfit items come in vivid colors or combinations that work and look great on both men and women. If you add a neckerchief to that, you will be the hottest chef in town! HERE is what we found as a proper chef’s shirt that can make a woman look like going to the club, not slaving in the kitchen. Ah, the mystery and art of the baggy pants! Why do chefs wear them? Well, for the obvious reason that these pants have to allow the chef to move, bend, twist, turn, take a leap even, walk all around the kitchen and, let’s face it, skinny jeans, no matter how fashionable, won’t give a chef the comfort and the freedom of movement that he needs. On the other hand, the ladies seem to have slightly different preferences when it comes to wearing chef’s uniform trousers, but men seem to prefer the baggies for comfort, large pockets and special textile to keep them cool even in very hot kitchens. These pants can be white, but mostly black nowadays, and they match just fine a stylish embroidered white jacket. Some male chefs go a little further and opt for a complete suit that in some cases looks just as good as a tuxedo. Here are some very practical, very stylish chef pants that will make you look professional and hyper-cool. 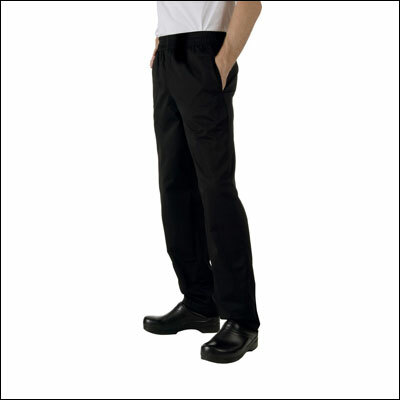 Check pants are not a big surprise in the world of professional chefs, as they have more of an utilitarian function, that of hiding the possible stains and splatters. However, some female chefs turned these useful pants into true culinary arts fashion statements, as they match both black and white chef’s shirt and go great with long aprons too. The check pants, besides their camouflage role, have also a more symbolic meaning, as they give the chef a sense of belonging. Since a kitchen has its own rules and hierarchy and can work as a small but efficient micro-corporation, wearing a special pattern or color combination is a statement of pride of belonging to that community. 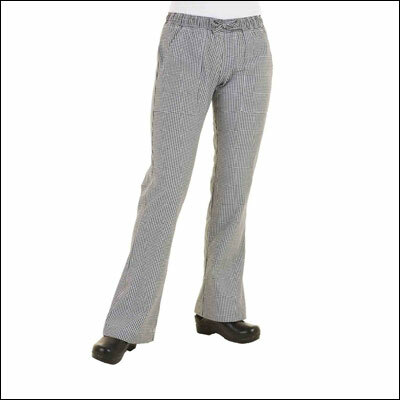 HERE are some great check pants for the ladies who want to dress to impress and cook to be forever appraised. Now let’s say you just opened your own gourmet restaurant. The first impression always counts and you know that before a customer takes the first bite of your fusion plate of exquisite dishes, he or she will take a look around and a look at you, to assess if they made a good choice by stepping inside. And as a good patron-chef, you have to look sharp, clean, confident and stylish. For future business restaurant owners, there are awesome outfit items that fit all these requirements, but the vest is something that will impress anybody. We know this is not Wall Street but a restaurant, but front-house outfit items that make you look like a professional chef are mandatory for good business. Think about all the critics and the press wanting to award you Michelin stars and world-wide reviews! 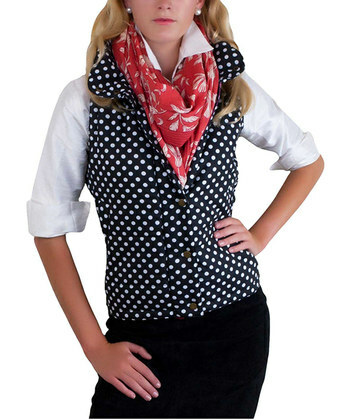 And since we have a thing for polka dots, there are some vests for both men and women that will make you look like the king (or queen) of your castle. As a good chef that you are or want to become, you know that the entirety of your job schedule relies on you being able to stand for hours, walk a lot, move in confined or large spaces, lean on some foot or the other, step, bend and turn. This means that if your shoes are not comfortable, you will suffer a world of pain and discomfort, translating into hip and back pains, flawed body posture and a lot of similar problems. 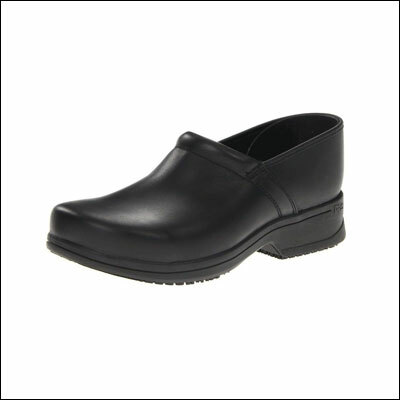 Chef’s special footwear is as important as any type of specialized footwear, be it working boots or gardening boots. From this point of view, you might think that any comfortable shoes will do the trick. Not so very true, considering there is an entire industry and design business concerned with creating the most comfortable and the best looking chef’s clogs and shoes that are durable, safe, easy to clean and to maintain, anatomically structured for comfort and also fashionable, and there are plenty models and brands to choose from. For today, we took a look HERE and decided we were more than pleased with these models. So what’s your favorite? What outfit items that will make you look like a professional chef you’d like to have or prefer to own? Are you attracted more to the classic white combos or to the stylish black ones? Thank you for this detailed description. Loved this post. Really uniform is very important if your in a profession like chef. If a person is in a chefs attire then there is no need to introduce him.